Are you looking for a top air mattress that doesn't break the bank? The best rated air mattress is easy to set up and deflate, and easy to store. It stays inflated throughout the night and is made with durable materials, while not feeling like a slippery, rubber air raft. Most importantly, it has to be comfortable, and while it probably isn’t going to feel as good as a real bed it should give a decent sleep. We’ve done some deep dive research into the world of air mattresses, comparing durability, comfort, inflation and much more and have determined that the SoundAsleep Dream Series Air Bed is the best air mattress on the market. Read our full buying guide to find out more about this great air bed and our other top picks as we break down the top five air mattresses, on the market, today. A cut above the other air mattresses on the market, the SoundAsleep Dream Series Air Bed is getting the most love online, in terms of customer satisfaction. Tens of thousands of people have bought this air bed and are loving it, so we had to investigate to find out why. The SoundAsleep Dream Series Air Bed is our top pick because while it isn’t always perfect, it has thousands of great reviews and their customer service is reported as excellent for those customers who haven’t been so satisfied. The design of this mattress is made to emulate the feel of a real mattress and box spring, as much as possible, with the company’s ComfortCoil technology. Rather than just one piece that inflates, this mattress has 40 individual air coils that inflate and make the mattress more supportive and stable. The bed is made with a durable and eco-friendly PVC material and the top flocking has a softer feel that makes sure that your sheets don’t slide around. While it feels almost like fabric, it’s waterproof and puncture resistant. A great feature of this bed is the built-in air pump, which inflates with one touch, in about four minutes. Easy to use and easy to top up, many customers report that a built-in pump is so much more convenient than an external pump and you can also use it to deflate the mattress. Users are saying this also works great, as it gets out all of the air, much better than if you have to squeeze it out, manually, making it easier to fold and store. Speaking of storage, the mattress comes with a handy storage bag, making it simple to put away in a closet when not being used. It comes in at just under 20 pounds and is not heavy to move around, after it’s inflated. Reviews overwhelmingly report that this bed is “extremely comfortable”, with thousands of satisfied sleepers. While a spare few suggest that this bed is even better with a mattress topper, that is not altogether surprising, since it is just an air mattress, after all. The majority of customers find this bed breathable and hot sleepers are also loving it. A few customers reported that they even forgot they were sleeping on an air mattress. While the mattress needs a top up of air every once in awhile, this isn’t unusual for an air bed and easy enough to do. While some customers have reported leakage, we weren’t overly concerned. First of all, the company discloses that this mattress is not intended for daily, long term use and some customers who reported leaking were using this as a long-term bed. Apart from that, we are impressed with their level of customer service, since nearly every customer who reported a problem with leakage or defect had their mattress replaced right away and received help from very friendly support staff. Just in case, this mattress comes with a great one-year warranty and while most customers haven’t needed it, it’s a nice feature. This mattress comes in at slightly under a queen size so sheets fit fine but there’s some room to spare. It has a nice double height, so you don’t feel like you’re sleeping right on the ground and it makes it easy to get in and out of. Extra tall people might find it a bit short so check the dimensions before purchasing. You want a built-in air pump: A built in air pump is super convenient, especially if you need a top up in the night. If you are looking for a bed with a built-in pump, with great reviews, this is the one for you. You want a higher bed: A higher bed makes it comfortable and easy to get in and out of and is especially good for people with mobility issues. Plus, having a bed that’s a bit higher just makes it feel a bit more like a real bed. You want a carrying case: While it’s probably not going to fit easily back in the box it comes in, a carrying case gives you a place to keep the bed when it’s not being used. You want a good warranty: Let’s be honest, when it comes to air mattresses, leaks and manufacturing defects can sometimes happen. A one-year warranty gives enough time to try this bed out and make sure it doesn’t have any problems. You sleep hot: The velvet like material on the top of this mattress, coupled with the breathability of the air pockets make this mattress comfortable and cool. 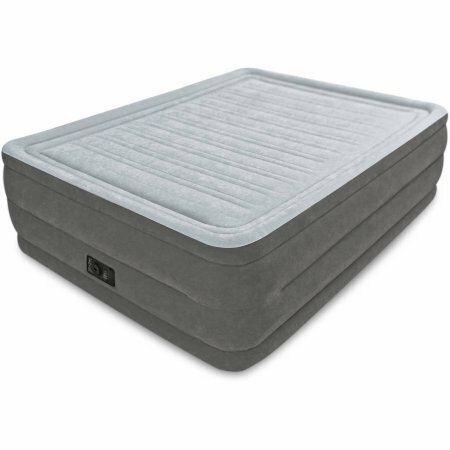 Even higher than our top-rated mattress, the Intex 22-inch Dura-Beam Comfort-Plush High Rise Airbed is a great choice for customers who have a hard time getting in and out of bed. With a host of other great features, this bed is a solid pick. The Intex 22-inch Dura-Beam Air Bed is a decent bed for the price and great for those on a budget. Like our first pick, this air bed also has a built-in pump that is quick and easy to use, with a touch of a button. Also, like the SoundAsleep mattress, this bed is made with plush flocking on the top cover, with horizontal air chambers, so the mattress holds sheets without being slippery, and is breathable, while still being waterproof. While there have been a few reported problems with leaks or defects, most customers say that this bed keeps its air, very well, overnight and some customers have mentioned they only need to top up of air once a week, or so. Great for couples, the queen size mattress has a maximum weight capacity of 600 pounds and there is very little sagging with two people, if the mattress is topped up to a firm level. At just under 22 pounds, this mattress is heavier than our top pick, but still portable and easy to move for most people. 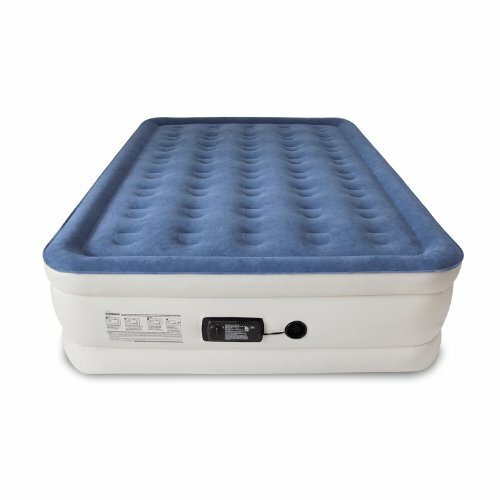 A great carrying bag helps make storage and moving easy, and best of all, this mattress is at a great price point, making it perfect for students or just those who don’t want to invest a lot of money in something that is only going to be used, occasionally. The only drawback of this mattress is their lack of warranty. A bit of a disappointment, while this company has tonnes of positive reviews, it couldn’t make the top of our list because of this. Since the majority of customers are satisfied with this bed and since the price point of this bed is so low, we still feel it’s a low risk, overall. You are on a budget: If you are a student or just someone that needs a quick and easy solution and you don’t want to break the bank, this could be a good pick, for you. You only need an airbed short term: Because this mattress has no warranty, and because air mattresses aren’t meant to be a permanent bed, this mattress might be best for those who only need an air bed occasionally, or for the short term. You sleep hot: Much like our top pick, the Intex air bed has a plush flocking top instead of sticky, slippery vinyl, as well as horizontal, breathable air channels. You are a heavier customer: With a 600-pound maximum capacity, this mattress is great for customers who are heavier and for those who have mobility issues due to their size. An air bed with some seriously luxurious features, this bed might be just as close as you can get to sleeping on a real bed, while still being portable and easy to store. With its luxurious “real bed-like” features, the Insta-bed air mattress is one of our top picks. 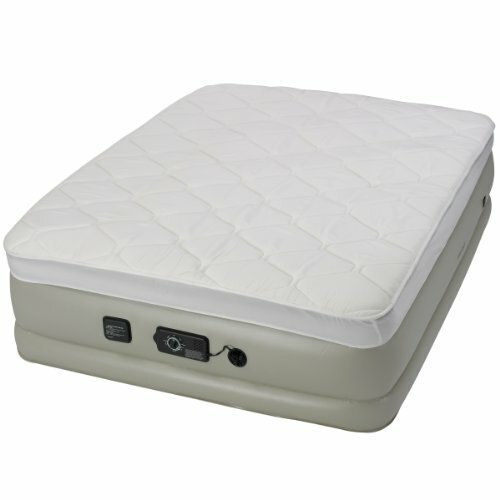 It features durable, puncture resistant PVC construction with a pillow top feel that includes air pockets for breathability and air circulation as well as an included, washable fabric mattress pad to make it feel like a real mattress. One of the best-selling features of this mattress its neverFLAT proprietary technology which includes two built in pumps. The first pump works to quickly inflate the mattress to its optimal height and firmness. The second pump works silently, through the night, to inflate your mattress, as necessary, ensuring that it never goes flat, a great feature to ensure the bed stays comfortable. Another nice bonus, this mattress comes with three comfort levels so you can actually set how firm you want the mattress to be. This mattress is heavier than other models, at about 30 pounds, but it is easy to store. It comes with a carry bag with handles so you can take it from one place to another, or hang it in a closet. It fits standard size queen sheets and they don’t slip off, which is also nice. While not as cheap as some of our other picks, this mattress has a nice one-year warranty and for all its features, this is a great pick overall. While some customers who are heavier say that this mattress doesn’t feel supportive to them, it does actually have a max capacity of 500 pounds and it is built with 35 individual circular support coils so it might come down to a matter of preference, for some. You want a pillow top feel: This bed has a pillow top style construction and a removable fabric mattress cover making it one of the more comfortable air mattresses on the market. You want a one-year warranty: One-year is a fairly long warranty when it comes to air mattresses, so this is a nice bonus. You want a removable mattress pad: While you can always add a purchased mattress pad to a vinyl air mattress, it is nice that this mattress has the flocking top, as well as a removable mattress cover, making it more likely to whisk away sweat and easy to wash.
You want a mattress guaranteed to stay inflated through the night: The dual pump system of this mattress is a great feature and it means that your bed isn’t going to lose firmness throughout the night. You want adjustable firmness: Another awesome feature of this air mattress is the adjustable firmness levels on the control switch. You can choose between three levels of firmness and the mattress will always stay inflated to that level. No doubt about it, Coleman is one of the most known brand names when it comes to camping and outdoor equipment. The Coleman SupportRest Double High Air Bed is a great pick and comes with the reliability of a familiar name. The Coleman SupportRest Double High Air Bed is another air mattress that makes our list of top picks and the reviews make it easy to see why. It’s made with the durable construction that Coleman is known for and is built with their patented AirTight system which tests each mattress, to ensure it is leak free. Users report that this bed is firm and comfortable and they like the plush coating on the top of the bed as well as the breathable air pockets. Heavier customers, including one customer who is just under 300 pounds and 6 foot 4, also find this bed supportive and comfortable and most are finding it very durable. While some customers prefer the built-in air pumps of other models, others like the idea of having an external separate pump. One advantage of this is that in an air mattress with an internal pump, if the pump breaks down, the whole mattress is done. With an external pump, you can simply replace it, or use the same pump for several beds. Likewise, when the bed finally calls it quits, you can use your existing pump on your new replacement. Portable and easy to use, this bed just needs to be deflated, folded into thirds and then rolled tight enough to fit into the included bag. And at only 12 pounds, this is the lightest mattress we feature, while still being queen sized and a great height of 18 inches. While some customers report a strong plastic smell for the first while, it does dissipate over time and although some users have reported some air leakage, the complaints weren’t significantly more than any of the other top air mattress on the market. At any rate, with a great one-year warranty, any defects or leaks will be handled by the company, which is a nice feature. Although you still need to purchase a separate pump, even with this extra cost, the mattress is a great bargain for the number of satisfied customers. 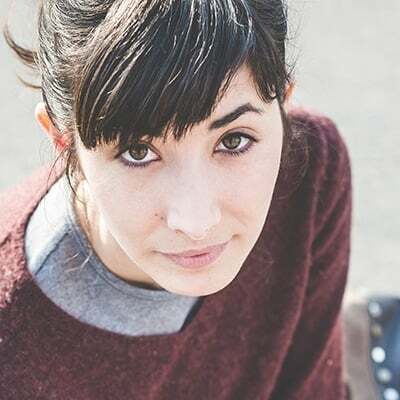 You want a familiar brand name: Nearly everyone who has ever gone camping knows the Coleman brand name and some people like a bit of familiarity when making their purchase. You want a one-year warranty: A decent one-year warranty beats many of the warranties on other air beds and we like the idea that if it has any defects or leaks, it can be returned. You want to use an external pump: While internal pumps are handy, they can turn a whole bed into a glorified paperweight, if they break. With this mattress, you can use an external pump and use one pump for multiple mattresses, as well as replace the pump easily, if it breaks. 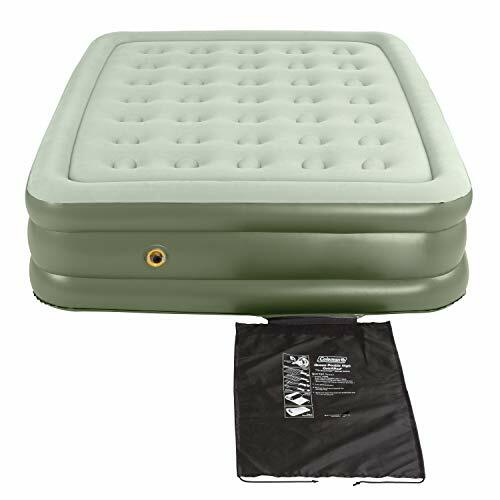 You are on a budget: Even with the extra cost of an external pump, this air bed is a great deal for such a high-quality bed with a decent warranty and great reviews. The Fox Plush High Rise Air Bed uses thicker vinyl than some of the other mattresses on the market – 50 percent thicker – making for a highly durable air bed, made from high quality materials, great for heavier customers and those who might have kids or pets jumping on the bed. 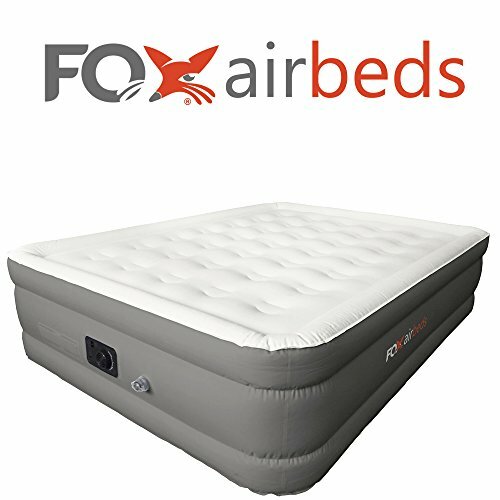 The Fox Plus High Rise Air Bed is a great choice for those looking for a highly durable mattress, made with high quality materials. Constructed with thick, .6 mm vinyl, this mattress has strong seams and customer reviews support the company’s claim that this bed does indeed last longer than some of the competition, with fewer leaks. The mattress is also very stable and boasts a flat sleeping surface, that is more supportive than other mattresses on the market. Because of its heavy-duty construction, it can support way more weight than some of the other mattresses on the market at a maximum 750 pounds, making it perfect for heavier couples or solo sleepers. That being said, this isn’t the easiest mattress to move around. Heavy-duty vinyl and a queen size bed means that this mattress is the heaviest bed on our list, at almost 36 pounds, so it might not be the best option if you have to move it in and out of the closet often, or move it from room to room. Although it’s heavy, it is super easy to inflate with the built-in pump, it also has the option to attach an external pump. It takes just over four minutes to inflate which is on par with most of the competition. Basically, it’s quick and easy to set up and take down, since the pump is a two-way pump and can also be used for deflation to make for quick storage. Despite its heaviness, customer reviews suggest that it does come with a carry bag, making it semi-portable, but a couple of people said they couldn’t get it to fit back into it, the bag broke or it was too heavy once in the bag, to store on a shelf. Most importantly, it’s comfortable. Customers are pleased with the pillow top like construction and the soft texture of the top. One customer even said that it was more comfortable than his actual bed and it has been described as extremely comfortable, by many. Standard sheets fit well for most people, with a few mentioning queen sheets are a bit tight. Overall, a solid purchase and while it is a bit more expensive than other beds on the market, you’re paying for the extra thick vinyl and the quality construction. It has a 90-day warranty, so while that’s not as long as some of the competition, reviews suggest that this bed isn’t getting many returns. You want a bed with heavy duty construction: If your air bed is getting a lot of use or you have children who are playing on it a lot, or even pets with sharp claws, this is the bed for you. You want a bed with a pillow top feel: This bed has been described by customers as having a pillow top feel and is super comfortable. You are a back sleeper: Some customers suggest that this mattress is extra firm and a couple that sleep on their back mention that this gives their back the firmness and support it needs so that they don’t wake up with aching caused from a saggy bed. You are a heavier customer: The heavy-duty construction of this bed means that it can support a weight of up to 750 pounds meaning that two heavier sleepers or one large person will be supported and comfortable on this bed. While there are plenty of good choices on the market and you’re likely to be satisfied with any of our top 5 picks, we give the number one spot to the SoundAsleep Dream Series Air Bed, for it’s extremely high number of positive reviews, at an excellent price point. Lightweight and easy to store, this mattress is a breeze to set up and take down with its built-in air pump and quick inflation. A handy storage bag and one touch button make this mattress so simple, even a child could fill it. And above all, it’s comfortable. It sleeps cool with the soft top flocking and air pockets and very few customers need to add a topper. With its individual air coils, reviews suggest it’s supportive and holds air throughout the night, needing an occasional top up. Convenient and easy to use, a decent air mattress is something everyone should have on hand, and since none of these options will break the bank, you can rest easy with your purchase.